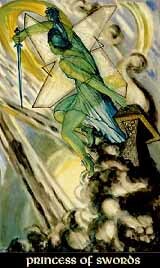 The Princess of Swords is the earthy child of her element, the wind over the grounds of Assiah. Her logic can be destructive, she is perceptive, serious and rigorous, yet she can show the characteristica of a child that lacks morality and nobility. Therefore, the Princess of Swords can get stubborn and cruel, and while beginning to think indepedently about something, she can turn very discriminating and egoistic, showing aggressivity whenever the result is not to her delight. In the Earth, all the free qualities of Air get surpressed and restricted. At her best, the Princess of Swords can be very practicle and clever, showing fine skills when dealing with material matters or conflicting opinions, she can be generous and kind once she lost the inner fear and insecurity that results from the natural incompability between Earth and Air.